At this moment, I am in bed at the ripe hour of nine o’ clock. My son is lying next to me as I’m holding a cool towel to his little, sweaty head. He has had a fever for five days. Poor little man. While my husband is at work (thank you dear for bringing home the organic nitrate-free low sodium bacon! ), I have been running a mini infirmary here in my home over the last two weeks. My three children have been politely taking turns being sick. Yes, now’s the time they are sharing just beautifully. Despite my best efforts, viruses have been running rampant in our little blue house. (I am so thankful that we are dealing with some ordinary sicknesses here and not, say, Ebola — I tell myself, one needs to maintain some perspective of gratitude in the drudgery). My energy, however, is non-existent. As I sit here on my bed, surrounded by a mess of toys and other random items, I wonder, what has happened to my house? My kitchen? My sanity? My body is convinced it is midnight. But the clock is dutifully honest. It is only nine o’ clock. And then I notice it. If you ask me, I think it’s rather unfair and wasteful for one woman to have absolutely everything going for her. Does she also need a flawless body as she does her world-saving tricks and such? What about the millions (trillions?) of so-called normal women in this world who operate on a fraction of what she has? But oh well. Who said life is fair? So I am here to say, I am not Wonder Woman. I’m pretty sure you already know this, as it’s obvious if you’ve read any of my posts … but just in case you’re wondering, I never was, and from the looks of it, I will never be. I am, instead, Weary Woman. Weary to the bones, that is what I am at the moment. No magical lasso to pick up toys and socks from the floor. No cape to fly over to the pharmacy for a third time in a day. No stamina to last through sleep-deprived nights. No Amazonian athletic frame to keep looking “great” while doing all of this. The weeks have been long, but I am still breathing. I need more sleep, but I am still somewhat sane. Absolutely, in a heartbeat, I’d settle for a fraction of Wonder Woman’s energy. A fraction would probably make me completely unrecognizable to my family. I’d wear that ridiculous headband if it gave me a boost. I’d attach that cape and fling it to the wind if it made me fly. I’d lasso away everything from the laundry, my sink of dishes, the bills, my aches and pains, to other world problems if I could. I’d wear Wonder Woman’s strong, flawless beauty if I could just wake up with it. But tonight as I sit in bed, I am actually perfectly content being the Weary Woman that I am. Wonder Woman has a nifty outfit that I have to sometimes “borrow” for a few days … sure, it hangs too loose in some parts and way too tight in others, but I will try to wear it for as long as I can. But in the end? I’m glad I don’t own this get-up, because it’ll never be me. In time, I’m sure I would end up finding it scratchy, un-breatheable, high maintenance (probably would need to be dry cleaned — imagine a superhero with a wrinkled costume?! ), and the tiara would likely set off my migraines. I am blessed because I don’t need an alter ego. I can just be me. And I don’t only have to rely on my superpowers to get through all the drudgery. No one expects me to save the world. Thank God. Instead, I get to rely on One greater than me. I get to lean on His strength and watch Him work through me. I get to be amazed by His powers. And I get to collapse on my mess of a bed, next to a sweet sick boy who may not think I’m Wonder Woman, but who nestles besides me nonetheless. He doesn’t want Wonder Woman. He just wants me. Just as it is with our Heavenly Father. I have to remember, that when all of us strip down to our humanity, this is what we cry for, to be accepted for who we are. To be wanted even in our mess. To be loved in our failing strength. To trust in someone bigger than us. I am thankful that we don’t have to be our own heroes. I am thankful I get to slip on comfy pajamas tonight, eat some coconut ice cream, and the world will not fall to shambles while I am doing that. Please listen to this wonderful song I Can Just be Me (click on song) by Laura Story before you go to bed tonight. Oh Kim, that song was beautiful. I love Laura Story! Have you heard her song “Blessings”? It was one of my favorite songs that comforted me when I had health problems. And it still does. I am so sorry to hear that your family has been under the weather for the past 2 weeks. I would be utterly exhausted!! But you are absolutely right, you are beautiful and wonderful the way you are. In all honesty, I feel like the real wonder woman is mom’s just like you, who are comforting their children and blessing their family everyday. You may be weary woman, but most likely it is because you been wonder woman all day. 🙂 I hope your family gets some sleep tonight! Marla, I LOVE that song. In fact, on the way to the store the other night, Blessings came on the radio … and I couldn’t stop the tears! It’s one of those songs that really hits you and keeps you going through rough patches. Your comment about “real” wonder women is so comforting and encouraging. I’m not sure if I am wonder woman all day, but I have my moments. 🙂 Thanks for the well wishes … we are (hopefully) on the mend. This post was so helpful for me – this week has been so incredibly exhausting, both mentally and physically. So thankful for your reminder that we don’t have to be our own heroes, and that Christ accepts us as we are – weak, weary, and heavy laden. Thank you! I am so sorry this week has been draining. 😦 I hope you find moments of peace in His presence. Yes He does accept us (which is totally amazing! ), and yet sometimes asks us to go through so much … and walk a road that is just not possible alone. Hang in there. I hope you start seeing some progress soon. This made me think of Isaiah 40…”He never grows weak or weary. He gives power to the weak and strength to the powerless…those who trust in the Lord will find new strength. They will soar high on wings like eagles. They will run and not grow weary.” I’ve had those weary moments too, when strength, soaring and even trust, feel a million miles away. Those are the times I’m thankful He knows the cry of my heart, because there isn’t strength for words. Sounds to me like you are your own unique version of Wonder Mom…I bet your kids think so. He counts you worthy to cool those little foreheads. Praying healthy days are on the horizon. Thank you for sharing your heart!! I absolutely love Isaiah 40. I struggle with weariness … and I wish I didn’t. However, it is the very thing at times that makes me rely on the Lord, even for little things most people take for granted. I too am glad that He knows my heart’s cry & blesses me despite my lacking strength. 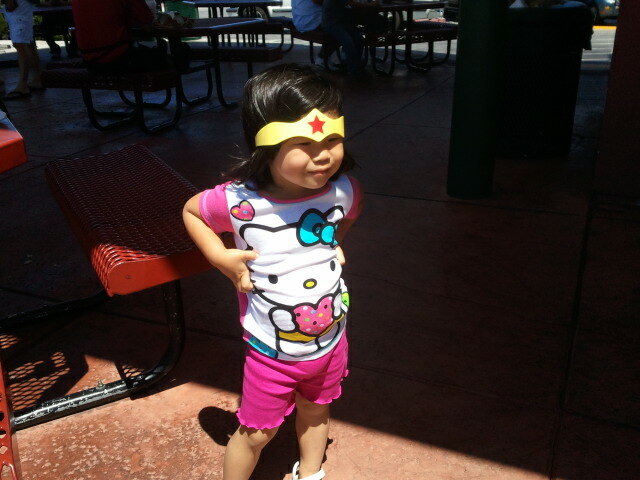 I’m not sure if my kids think I’m wonder woman … perhaps a few years ago when they were too little to know any better. 🙂 But you bring a sweet reminder to light … God has counted me worthy to cool little foreheads. Wow! Beautifully said. And so true.